Come be a part of the 2019 Houston Livestock Show and Rodeo - the world's largest livestock exhibition, world's largest rodeo and premier entertainment event! More info at www.rodehouston.com. Rodeo Houston, now in its 86th season, is one of the most-attended events in Houston. Millions of people are drawn to the rodeo for the barbecue cook-off, carnival, rodeo competitions, livestock auctions, art auctions and the other dizzying array of activities, but its concerts get some of the most attention. 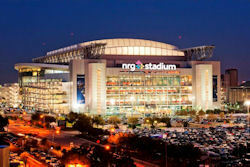 Sunday, March 17 concert is George Strait. There is no rodeo performance scheduled before the George Strait concert, however, all activities on the grounds including shopping and dining areas, carnival, livestock and horse show competitions, and other exhibits and attractions at NRG Park will be open to the public on March 17.